When you add or edit a service area, you have the option of customizing the text that appears on these overview pages by using the “Advanced Features” button in DSS. The “Advanced Features” button is found at the very bottom of the page in DSS any time you edit an existing service area or add a new one. Clicking this button will open the advanced features, where you can add a title, headline, meta description, and content that shows on the category overview page for that specific service area. Why Use the “Advanced Features” for Service Areas in DSS? Avoid duplicate content. If the overview information for each of your service areas is the same, then it will show the same text on the overview pages for each service area you’ve added. So, if you have five service areas, that text will show five times on your site. This can create issues with duplicate content, which could count against you when Google’s crawlers look at your site. Using the advanced features to update overview information for every service area you add removes that risk. Customize your service areas. Using the advanced features also lets you better focus the overview text for the service area, which gives your readers a better idea of what they’ll find in the content. Sometimes, too, using the top-level overview text doesn’t make a lot of sense when it’s narrowed down to one practice or service area. Customizing the overview text for each service area helps you make sure that it will make sense in context. To make the most of the customization available, we recommend that you fill out the advanced features any time you add a new service area to your website. Step 1: Log into DSS. Go to Site Core > Service Areas. Choose Search and Edit to find and customize an existing service area, or go to Add New if you are creating a new service area. 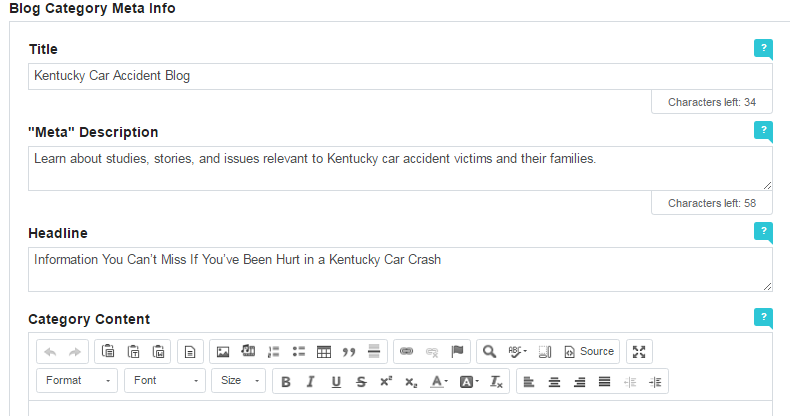 Step 3: Under Blog Category Meta Info, click on the text field under Title. Type in a new title for the blog overview page that is specific to the service area you’re working with. This is limited to 60 characters. Tip: Be sure to watch the “characters left” box under the Title and Meta Description fields so that you don’t exceed the character limit. Step 4: Click on the text field under “Meta” Description. Type in a new meta description for the blog overview page. This is limited to 160 characters. Step 5: Click on the text field under Headline. Type in a new headline for the blog overview page. The length is not restricted, but keep in mind that the text will appear in large letters at the top of the overview page—so keep it reasonably short and to the point. Step 6: Click on the text field under Category Content. Type in new text that will display under the headline on the blog overview page. This is usually a brief overview—a few sentences or even a paragraph or two—of what the reader should expect from the content or how to contact you for further information about the service area. Step 7: Move on to the next section, and repeat steps 3 through 6 for each remaining Category Meta Info section: Library Category Meta Info, Frequent Questions Category Meta Info, Testimonials Category Meta Info, and Videos Category Meta Info. You should make sure to fill out all the available fields for all the available sections. Tip: Click on the blue “?” bubble to the right of each field to see helpful information about character limits, best practices, and more. Step 8: Click the SAVE button in the upper right corner of DSS to apply your changes. Updating the advanced features for service areas in DSS is effortless, and it offers you another way to easily customize your website. If you have any questions about this or any other feature in DSS, give us a call at 888-886-0939, open a help ticket in DSS, or email [email protected].